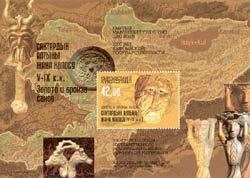 ..:: Postage stamps of the Kyrgyz Republic 2003 ::..
"10th anniversary of International Association of academy of sciences"
Postal labelled envelope "100th centenary of S.A. Chuikov"
2200 years of the Kyrgyz statehood. The gold and bronze of sakes. 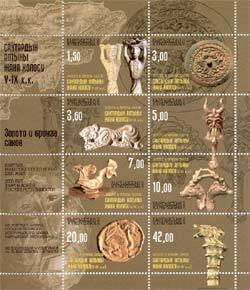 Special small sheet of 8 stamps– the feminine bronze figurine, coin, name plate in the manner of the tiger figurine, statuette with scene deity, golden cockerel, heads of mountain ships, name plate from sheet gild, decorated by pressed scene of the bird, handle combat dagger. 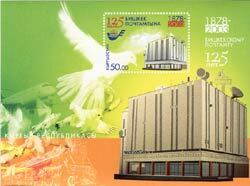 125 years of the Bishkek main post-office (1878-2003). 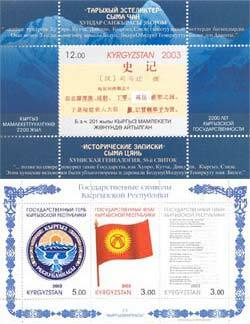 2200th anniversary of the Kyrgyz statehood. 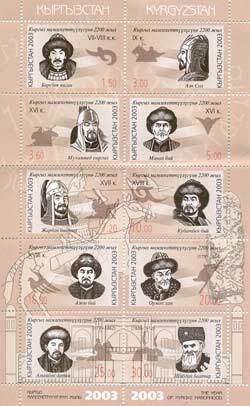 Special small sheet of 10 stamps- Barsbek cagan (VII- VIII cc), Alp Salt (IX c.), Muhammed Kyrgyz (XVI c.), Manap biy (XVI c.), Sharban baatyr(XVII c.), Kubatbek biy (XVIII c.), Azhy biy (XVIII c.), Ormon khan (1791- 1854), Alymbek datka (1799- 1862) and Shabdan baatyr (1839- 1912). 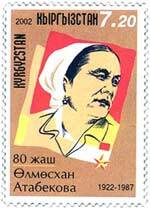 Special small sheet of 1с stamps – holiday hotel of “Rahat”, rest home of “Raduga”, sanatorium of “Teltoru”, sanatorium of “Kyrgyzskoye vzmorye”, sanatorium of “Tamga”, rest home of “Solnyshko”, rest home of “Vityaz”, rest home of “Akbermet”, rest home of “Royal beach”, rest home of “ Luchezarnoye poberezhye” . 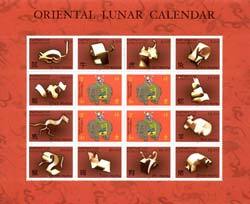 Special small sheet of 12 stamps- there are original specimens, presented with animals of corresponding year of moon calendar, Chinese hieroglyph on the stamp. 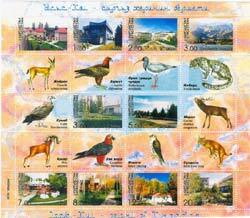 Date: 30.12.03, series of 1 stamp.